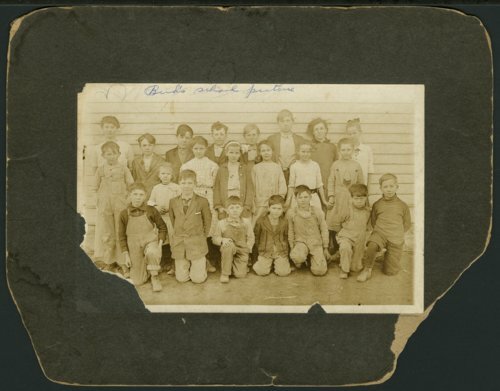 This is a photograph of school children posed by their school in Valencia, Kansas. Children in the photograph are identified as: front row (left to right) Joe Graham, McKinley Atkins, Bud Graham, Virgil Keaton (? ), ______, Bud May, Lewis Kienne; middle row (left to right) Al Wilson, Edna Morris, Nellie Morris, Freda Gladwell, Katy May, Alice Gladwell, Bernice Smith; top row (left to right) Mrs. Chitwood, Edward Morris, John Drury, Edward Alexander, ______, Alvin Morris, Edna Alexander, and Georgia Gladwell.